I don’t want to just praise the Apple Watch here but let’s face it, it’s the “new thing” to hit the market in terms of wearable devices these days. With the new craze surrounding the Apple Watch and it’s features, I must admit, if Apple wanted to send me a watch to test and evaluate, I’d accept the offer. The technology is amazing and seems extremely useful for business purposes when it comes to checking who’s calling, texts, emails, etc. But when it comes to the fitness side of the watch, that’s where I want to get down to business and find out how it really performs. The Apple Watch is swinging for the fences, but exactly how far is the ball traveling? Many fitness trackers that are wearable such as the ones on the wrist are found to be less than accurate. There are better devices than others, but in general, they all seem to have their flaws when reading heart rates. Some wearable trackers are way over or way under the true heart rate of an individual depending on the activity level. If you want to get the most accurate reading, the best thing to do would be to purchase a chest strap monitor. It seems that depending on the wrist monitor, anything from motion, ambient light, and skin tone can affect the accuracy of the reading. When researchers dove into the subject further they picked up a few different models to see just how accurate they are. The models they chose were the Apple Watch, Fitbit Charge HR, Basis Peak, and Mio Alpha. For their study they gathered 50 healthy adult participants who were asked to exercise on a treadmill. Each participant wore an electrocardiographic (ECG) limb lead as well as a Polar H7 chest strap monitor to look at how all the different devices performed and their accuracy when reading heart rates. For this particular study, the researchers collected the participants heart rate at rest and then on the treadmill when walking/running at 2 mph, 3 mph, 4 mph, 5 mph, and 6 mph. Each speed segment lasted 3 minutes before the participant’s heart rate was checked and recorded. The average between all participants was from 49 beats per minute (bpm) to 200 beats per minute. As expected, each heart rate monitor varied in terms of accuracy when compared to the ECG. Out of all the devices (not counting ECG) the chest strap monitor by Polar came out as the clear winner with a 99% accurate reading. The readings from the chest strap device was the closest to the ECG readings. But we are more concerned about the wearable wrist devices so who came out on top? Surprisingly (to me at least), the Apple Watch came out on top with the most accurate reading out of all the wrist monitors. The Apple Watch and Mio Fuse were found to be right around 90% accurate while all the other wearable wrist devices were in the low 80’s. 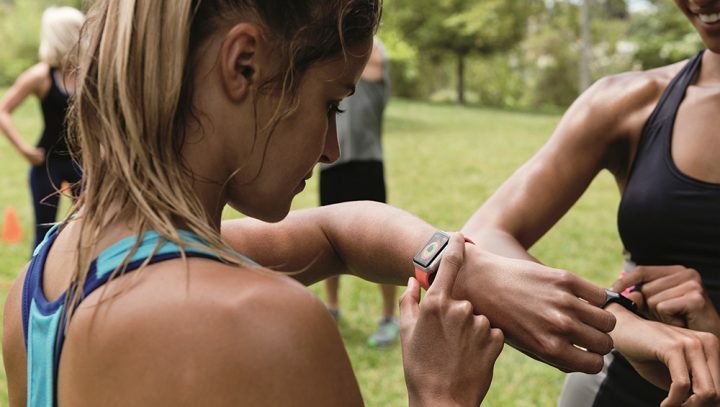 To me, the Apple Watch truly seems like a home run if you compare everything that it can do not only as a convenience to business with all its capabilities, but now as a viable option to use for fitness tracking. One of the interesting things about this particular study was that as the intensity of the activity increased, the accuracy of each heart rate monitor declined. One researcher said, “What we really noticed was all of the devices did not do a bad job at rest for being accurate for their heart rate, but as the activity intensity went up, we saw more and more variability. At the higher levels of activity, some of the wrist technology was not accurate at all.” This could be caused by the overall movement of the body and the device not being able to maintain a proper reading due to it potentially moving around slightly on the wrist. Therefore, it might be wise to only use these devices if doing a low to moderate workout intensity. For instance, if you are walking, riding a bike, even a light jog might be acceptable for these types of wearable devices. On the other hand, something like running or doing sprints might not be beneficial if the accuracy is too far off to get a true reading. So there are pros and cons dependent on how you plan on using the tracking device. While the Apple Watch was the clear winner for wrist monitors, the study seemed to leave out some of the best-selling devices on the market from brands like TomTom and Garmin. It would be interesting to see how the Apple Watch compares to these since it blew the Fitbit out of the water. I would recommend, however, that if you are an elite athlete or have any type of medical condition where you need to know your heart rate at an extremely high accuracy level, simply invest in a heart rate monitor in the form of a chest strap. They are still the “golden standard” when it comes to accuracy for wearable devices. All the companies did want to make it clear that their fitness monitors are not medical devices and should not be treated as such. They want to ensure that their devices are not being used to treat or diagnose anything and even went as far as to say you can’t count on their devices in that specific context.